The shortest, not the prettiest but worth the trip. This description aptly sums up these hills but I feel obliged to expand a little. Shortest - these are without doubt the quickest and most accessible munros in Scotland with a meagre 579m of climbing to complete the triplet. In 3 hours all summits can be conquered and even for those who normally take time to drink in the surroundings the 5 hour time barrier should be easily broken. Not the prettiest - unless you get excited by naked ski runs, dodgy huts and pylons. The ski area, as would be expected, has had a big impact on the area and as such provides an alternative slant on what could be expected at a hill top. But that's the price we pay to enjoy our skiing, which in contrast to the opinion of "Greenies" in London, is reasonable. Worth the trip - aside from allowing the avid bagger to tick off three more boxes, from the ski area to Carn a Gheoidh is like any other hillwalk, offering the spectacular scenery we sometimes take for granted. The easy access is also a pleasant change allowing for either a late start or alternatively an early departure leaving a full afternoon to enjoy a pub lunch. 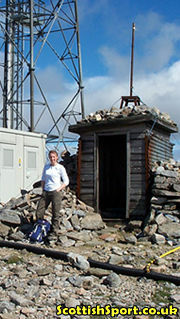 Having spent as little time as possible at the summit follow the path NW for approx. 800m. It's then time to enjoy the scenery, as the track snakes westwards for approx 3km to lead you to the summit of the second munro Carn a' Gheoidh (975m, GR107768). 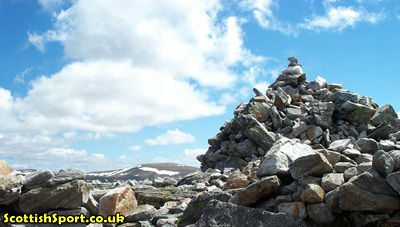 From the summit of Carn a' Gheoidh retrace your steps to the small bealach at GR128782, from this point follow the rocky track North, then NW to gain the third summit Carn Aosda which slimly gains munro status (917m, GR134792). From Carn Aosda follow the easy grassy slopes southwards to get back to the carpark.